Circuit Break is a Booster Pack in the Yu-Gi-Oh! Official Card Game (OCG) and Yu-Gi-Oh! Trading Card Game (TCG). It is the second set in the OCG's 10th series, following Code of the Duelist. and followed by Extreme Force. Includes cards used by Yusaku Fujiki, Skye Zaizen, George Gore, Emma Bessho and Varis. The TCG version also includes cards used by Gloria Tyler and Grace Tyler. Includes members and/or support for the "Abyss-", "Bamboo Sword", "Cyber", "Fire King", "Fire King Avatar", "Gouki", "Nimble", "Mecha Phantom Beast", "Mermail", "Ojama", "Phantom Beast", "Trickstar", and "World Legacy" archetypes. The TCG version includes members and/or support for the "Amazoness", "F.A. ", "Lunalight", "Lyrilusc", "Number", "SPYRAL", "Subterror" and "Vendread" archetypes. 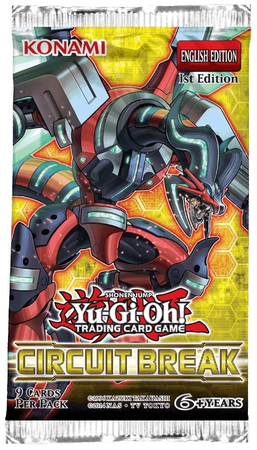 Introduces the "Altergeist", "Krawler", and "Rokket" archetypes, as well as the first support for the "Metaphys" archetype, to the OCG/TCG. ↑ "The Organization | [OCG] Circuit Break". YGOrganization. March 13, 2017. Retrieved March 13, 2017.